This piece features Knotty Pine veneers hand selected by Kindel's Grand Rapids artisans for a beautiful grain pattern. 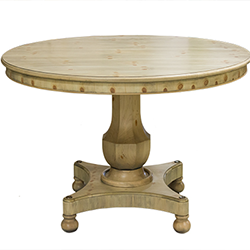 The urn-shaped pedestal sits atop a quad base supported by bun feet. The apron features a fine molding. This table features 4 bronze Putter Boy medallions applied to each corner of the base. Avaliable in all wood or pigmented stains and painted lacquers. Dimensions: Height: 29.75", Diameter: 60"